Also was to use a scan that didnt receive much if any favs around MT, or isnt here at all. Considering the DBZ section, this wasnt too hard for me. Why I choose this, well..basically its the Saiyan ethos. You practically never see them going off and running. Its always 'Ok, dont matter how big and bad, we kick their a$$'. They live life, going through their trials and tribulations, and never backing down. I rather like that. So bear with, and enjoy! Update: Vectored the image, redid the fonts. Well..lets see how this does. Browse Dragon Ball Gallery: Recent | Popular. Nice interpretation of the song lines (however you did pick it) and lots of fiery colours around the often dead Goku. Nicely worked DBZ wall Teryon -resists urge to quote a lame DBZ line-. 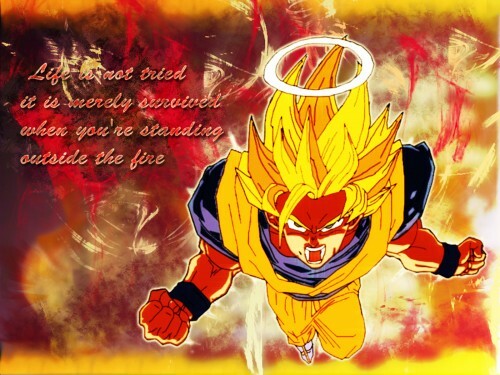 I've always liked this picture of Goku, keep up the good work. Agree with kuroimisa, the rext need more work. It looks as though you cut and pasted in the text rather than just making a new layer on top of the original image just for the text it self. Added to favs :D ! ps - You are not alone, just don't like the English dubbed verison. I think it is perfectly okay for a seasoned anime fan to watch and like DBZ. DBZ is a great show, and I find anyone who doesn't acknowledge that fact isn't a seasoned anime fan. You don't have to like it to admit it is a great show. As for the wall, I love it. Strangely enough the reference to Garth Brooks suits it quite well. The colors all work, and it has a powerful emotion that it conveys. 5/5. Thanks for sharing, and + fav.